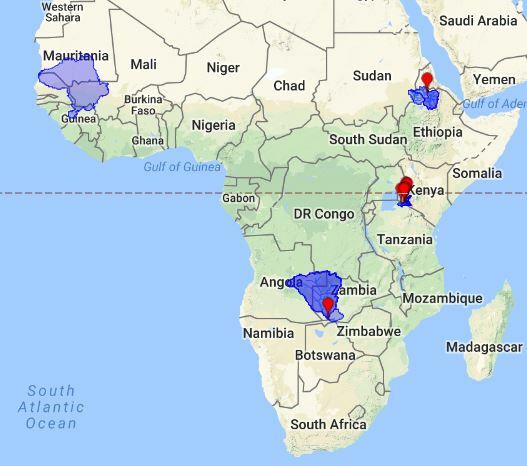 Through a continuing collaboration between The University of Arizona, NASA-SERVIR and diverse African partner institutions, ICIWaRM has been developing monitoring tools and near real-time streamflow forecasting applications using satellite precipitation measurements and numerical weather model results. The studies have taken place in four basins: The Senegal, Mara, Tekeze and Zambezi river systems. All of the basins face complex challenges, from high seasonal and inter-annual variability to competing demands between irrigated and traditional agriculture, hydropower, urban water supply and navigation. They are also poorly gauged by western standards, making satellite products the primary sources of information for near real-time estimates of precipitation to support water management and reservoir operations. 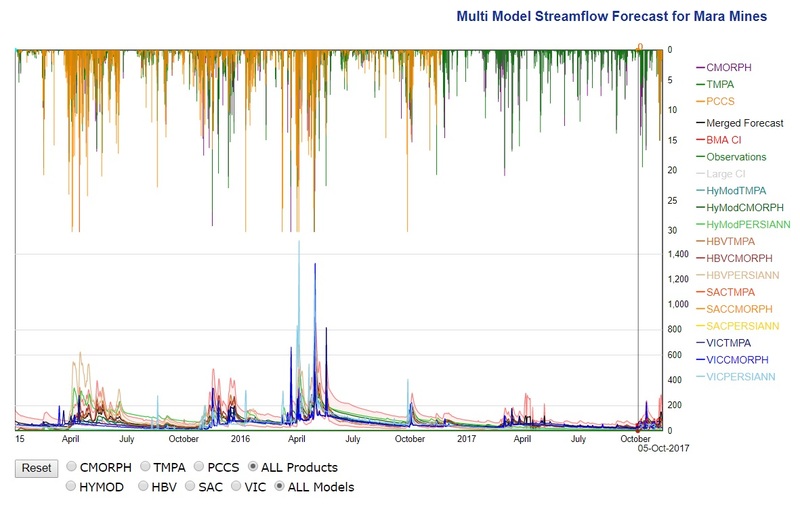 We have adopted a multi-model simulation approach for both real-time precipitation and streamflow prediction. No single precipitation estimation product and no single hydrologic or land-surface model performs uniformly well in Sub-Saharan Africa, so our multi-model approach is enabling us to examine and understand what works best in each basin and why. Mara River discharge and forecasts using many sources of rainfall information and models. Source: www.swaat.arizona.edu. Adopting an integrative regional approach, we have been working with many regional partners: the Regional Center for Mapping of Resources for Development (RCMRD, Nairobi, Kenya); the International Senegal Basin Authority (Organisation pour la Mise en Valeur du Fleuve Senegal; OMVS) in Dakar, Senegal; the AGRHYMET Regional Center (in Niamey, Niger), and the Climate Services Center of the Southern African Development Community (CSC-SADC in Gaborone, Botswana). This is part of an effort to create a network that pools each other’s knowledge and expertise, and to enable sharing and dissemination of solutions that work, benefiting from both African and international expertise. Partnering regionally has clearly improved accessing, processing and analyzing of relevant data using the regional partners’ historical databases of climate and streamflows. More information on the project, including 10-day and seasonal streamflow forecasts for some of the basins, and scientific publications arising from the work, may be found at www.swaat.arizona.edu.